DVD+R 4,7GB, 16x Speed 10τεμ. 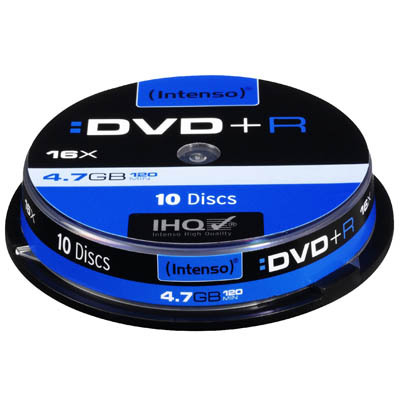 DVD+R Intenso 4,7GB, 16x Speed Cake 25τεμ. DVD-R PRODISC 4,7GB/120MIN 16x 25τεµ. DVD-R TDK 120M 16X 4.7GB Cake 25τεμ. DVD-R 4,7GB 16x Speed Cake 25τεμ. MR DVD-R 4.7GB 16x - Cake 25, inkjet FF print. MediaRange DVD-R storage media are perfect for archiving your data quickly and efficiently. The excellent recording stability allows your data to be saved in just a few minutes with write speeds of up to 16x. that have a CD print function. Give your media an individual and professional design just the way you want. DVD-R 4,7GB 16x Speed Printable Cake 25τεμ.